Emma Robertson is an Academic Advisor in the Farmer School of Business. In this role, she assists first-year business students with major and career exploration, course selection and registration, and academic planning. Emma completed her undergraduate degree in Psychology at Oberlin College, and master's degree in Higher Education with a concentration in Social Justice and Diversity at University of Michigan. 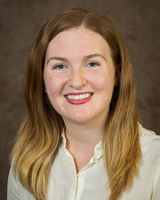 Emma is passionate about educational access and equity and utilizes her background in student development theory to support all Farmer School students.